Almost as soon as I stepped off the train at Waverley Station, Edinburgh, I became aware that I was less than enchanted by this usually enchanting city. You might say that my heart is still in the highlands, you might say that I’ve taken this trip once too often. The rail station was undergoing renovations, so my usual path out (The Waverley Steps) was closed off. This meant walking up the ramp into one of the busiest streets in town, particularly on a Friday afternoon during festival season. I managed to make my way through heavy, plodding crowds, as bad as pushing myself around Times Square. I got to my hotel, the Albany Ballantrae, and was immediately struck by condescending atmosphere, which I had encountered the last time I stayed here, two years ago. It calls itself a boutique hotel, but whatever that vague term means there is little to back up that claim. A boutique hotel provides more than one plastic cup in the room. In fact even lowly non-boutique hotels often trust their occupants with a glass. Boutique hotels have accessible wi-fi. This one claims to have it but I cannot connect to it, whereas in the three decidedly non-boutique hotels I stayed at during my highland fling I connected easily. Boutique hotels should not be lazy about breakfast, but this hotel is. Continental breakfast only, unless you want to pay an extra fee for hot breakfast – but at least you have to let them know you WANT a hot breakfast the night before. The hotel also rolls back its breakfast hours on weekends. It normally starts at 7:30 am, but here you can’t get food until 8 am on Saturdays and 8:30 am on Sundays, which means that I will not get the included breakfast until Monday. Boutique hotels ARE often full of themselves, and such is definitely the case with the Albany Ballantrae. Ah well, perhaps I protest too much, but neither my arrival at the station nor my reception at the hotel boded well for a great last foray into the Edinburgh Festival. Frustrated at the hotel I traipsed off to the Hub, fighting crowds on The Royal Mile every meter of my way, where I managed to pick up all the tickets to the Beijing Opera we will see tonight. I did a little shopping as well, got back to the hotel and prepared to meet students back at the station, then headed over about an hour early, had a not very good tuna sandwich from The Upper Crust, whose baguettes often destroy my Upper Palate. Then a pint of ale from the pub at the station. 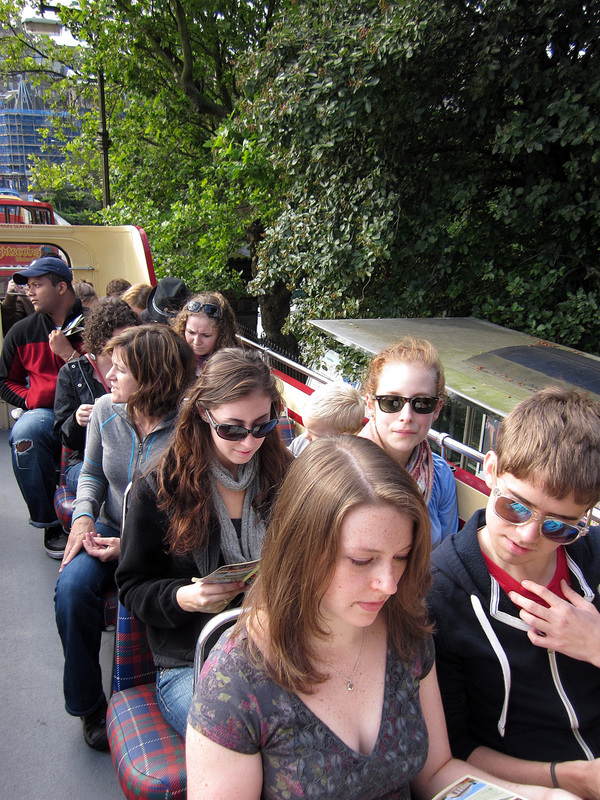 Got the students and the TenEycks off the train – twenty-seven students! I’m probably just not half the man I used to be, but that’s a lot of students to cart around. They had had a bad trip, waiting five hours on the tarmac in New York, barely making the train, and rather punchy from the experience, quite understandably. After a good night’s sleep and a good morning’s breakfast, they should have a grand time here, and I plan to show them a fine weekend, no matter how little I may enjoy it myself. I arose early as usual on Saturday, the first full day of our weekend at the festival, and also as usual checked outside my window and BBC weather. It looked surprisingly good! And that of course is a very good sign. The sun is shining, there looks to be a chance of showers tonight, but otherwise partly cloudy to clear on Sunday AND Monday? Unheard of! 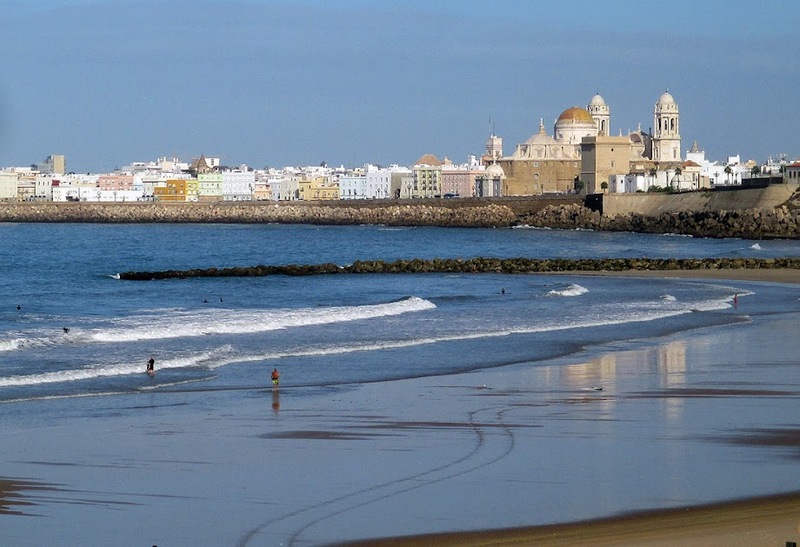 Tuesday looks to be wet, so we may get drenched on our way to the train station for our return to London, but weather-wise at least, this may be a fine trip. So perhaps it’s time to readjust your attitude, Dottore Gianni! It’s too late for that, I fear, but I strode out towards the hostel with confidence, and was pleasantly surprised that all the students were down for breakfast, that all seemed enthused for the day. Steve, Becky and the boys were raring to go as well, and after a few admonishments re keeping up with the pack and watching carefully at all street crossings, we left the hostel and got rather easily to Waverley Station, considering the size of the group. Opposite the station the tour buses line up and we always try to get there early, so we can get the entire top of a bus to ourselves. We chose MacTours, which runs vintage buses through the Old Town and New, and usually features completely open tops – this particular one did not, so a few of us were stuck under a canopy, but our tour guide, the first woman that I’ve ever taken the trip with, was very knowledgeable if not all that witty, and the tour was a fine one. I did something after that I’ve never done, partly because the weather was so nice. I took them into Prince’s Street Gardens and regaled with a few stories the guide had omitted, then issued some more instructions and gave out tickets for the evening performance that we would attend at the Edinburgh International Festival. 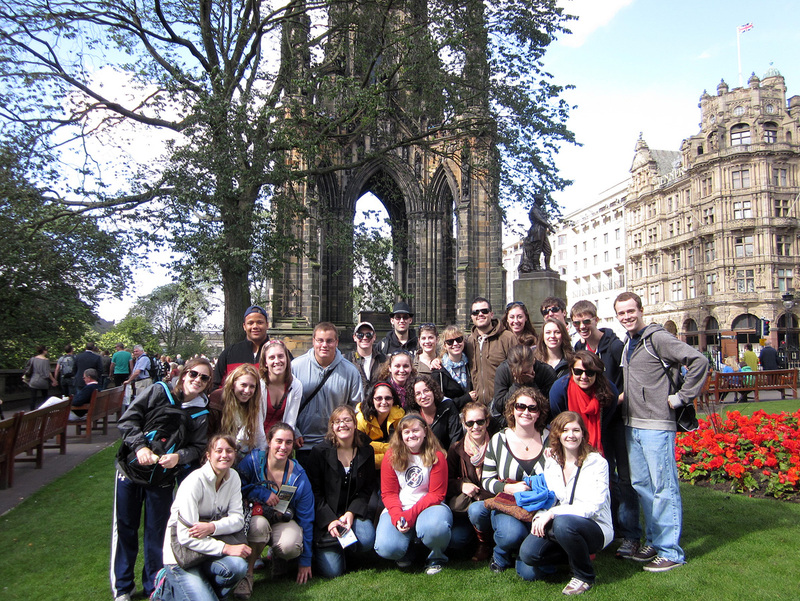 I also took a group photo at the Scott Monument, which turned out to be smashing, then took them up to the Royal Mile, where we were soon engulfed by buskers. Got another shot in front of the Fringe Box Office and let them all go in their separate directions. Steve and Becky, their boys and I then had lunch at the Deacon’s Café, luckily uncrowded at the time, and serving its usual excellent soup and scones. They too went on their merry way, and I was left alone to do as I liked for the entire afternoon. It was such a lovely day that I decided to stroll slowly in the direction of the show I would see at 1:15. 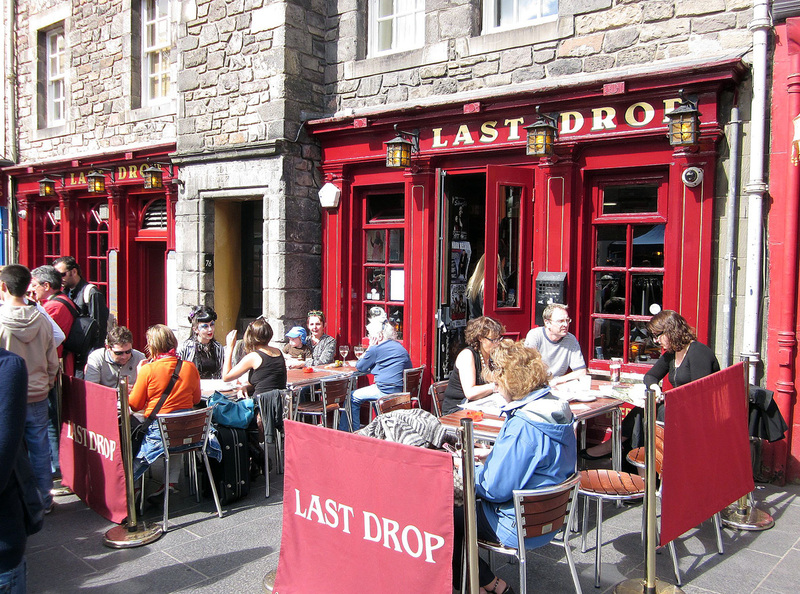 I descended into Grassmarket, one of the friendliest spots in the city, where a market was in swing, and of course where all the outdoor seats at the several pubs, bistros and bars were filled. Then I wandered over to Cowgate, to Greyfriars’ Kirk across from the Museum of Scotland, and finally to my destination, major Fringe Venue The Gilded Balloon. I bought a ticket for Nobody’s Home, alum Will Pinchin’s show at that venue, and settled in to see it. Will studied at the LeCoq Institute after graduating from Ithaca, met his wife there, and they formed a company that focuses on physical theatre. This piece focuses on a U.S. vet with post-traumatic distress syndrome, but tells the story as if he is a modern-day Odysseus, trying to return “home.” He IS home, with his increasingly frustrated wife (played by his wife in real life, Dorie, who plays all the other characters). It was a unique and I thought fascinating way of looking at this all-too-prevalent disorder, and it was executed with impeccable timing and very strong performances. Very glad I went! I had a pint with Will, Dorie and some other of their friends, then strolled back to the hotel. 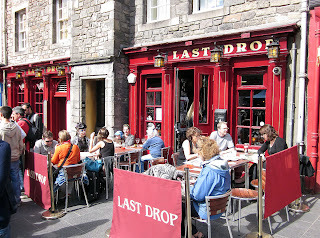 There I rested, then charged back out to get a bite before seeing the play we chose at the Edinburgh International Festival. I had wanted to eat at Pizza Express, but it was packed, so I ended up at Pizza Paradise, which was anything but – first it was hot as Hades (placing it in a location on the far side of paradise), second the food was mediocre, to put it kindly, but at least it was expensive! Made it from there to the Festival Theatre, met up with some students, also with Steve, with whom I had a gin and tonic for the first time in memory – very tasty…and a nice antidote to Pizza Inferno! And then on to the Beijing Opera, The Revenge of Prince Zi Dan. Beijing Opera is an acquired taste, and most of the students did not acquire it at this performance. This Asian version of Hamlet was interesting to me, but I wish for their sakes and mine that it had had more action. Nevertheless I judged the evening to be a qualified success. Steve and I left for our respective “homes” in Edinburgh, while many of the students found a pub that stayed open late and ended their evening that way. The morning started out less promising than had Saturday, the skies gray and threatening, but still we headed out for the castle and had a reasonably good few hours there. A sudden sharp shower sent everyone scurrying for the few indoor spaces the castle offers, and I think some of the students were hoping for something more romantic and ruined in nature, otherwise the morning went well. 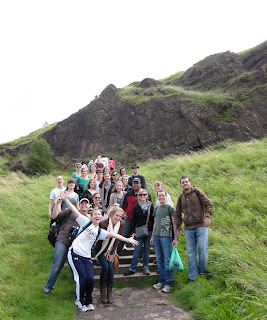 We then snaked our way slowly through the crowds down the Royal Mile, stopping at the area known as World’s End so that the students could grab picnic lunches for their next event of the day: the climb up Arthur’s Seat. 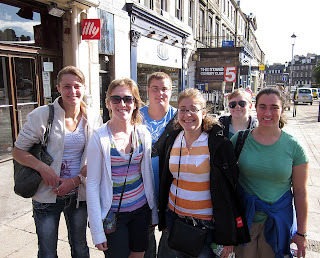 I left them under the good care of Anna Reetz and walked back up the Royal Mile with the TenEycks and with Mandy Perry, who I think would have loved to make the climb with the others, but she was nursing a broken toe and wisely chose to stay behind. The TenEycks and Mandy found a place to have lunch, and I continued on alone, my usual and generally preferred method of travel. I took a walk past some of my old haunts in Edinburgh, including Ryan’s Bar, the International Book Festival, and the entire length of Rose Street. Pleasant and nostalgic, but longer than I’d intended, particularly after the walk from hostel to castle and from castle all the way down the Royal Mile. So I really crashed when I got back to the hotel. I worried a bit for the students on Arthur’s Seat, but by early afternoon the day turned more and more lovely, and I’m certain they enjoyed their brief life at the top. I’m now back in my hotel room after having a light supper at a place in my neighborhood, along Broughton Street, called Treacle. I had a great time, though I think I was probably 20 years older than anyone else in the place. And now I am watching Verdi’s Requiem, broadcast live on BBC 4 from the Royal Albert Hall, one of its many Proms concerts, most during the month of August every year. Tomorrow looks to be another good day as well. Here’s hoping, as it’s my last full day in Edinburgh, probably forever, and the students’ last as well, for this trip at least. Not a lot to tell about today, as after breakfast everyone was left to their own devices. others planned on visiting museums, seeing more shows at the Fringe etc. The TenEyks went off in search of amusement for Parker and Riley. I went for a long walk – or maybe it wasn’t that long, and I’m just getting tired quicker? -- more or less down memory lane. I took some photos and sat for a while in Princes Street Gardens. I visited the National Gallery, always a favorite thing to do. I was somewhat disappointed that the Titians were in storage, in favor of an exhibit of National Portrait Gallery items, as that gallery is now being restored and will re-open in November, but I was rewarded by stepping up into my favorite portion of the Gallery, the Renaissance section, as they have included (on loan) a Madonna and Child by Leonardo da Vinci, in addition to the madonnas by Rafaello and an exquisite pieces on the same subject by Botticelli. And then I walked the short distance to my favorite Scottish shop, the inexpensive and touristy Edinburgh Woollen Mills, and bought a very warm sweater that I’ll be able to use frequyuently when it gets colder out, which it most certainly will. I’m to meet some of the students at the Theatre Royal Bar in a little over an hour, and then meet the TenEycks for dinner Italian style at 6 pm. After that an early night in front of a very early morning – and back to London! And, oh! As of 4 pm the weather has held beautifully, making this hands-down the winner of the BEST WEATHER for three full days in a very unpredictable Edinburgh. Addendum to Monday on Tuesday morning: Anna Barth had said she’d deliver students to the Theatre Royal Bar, and she did, for which I thank her very much! 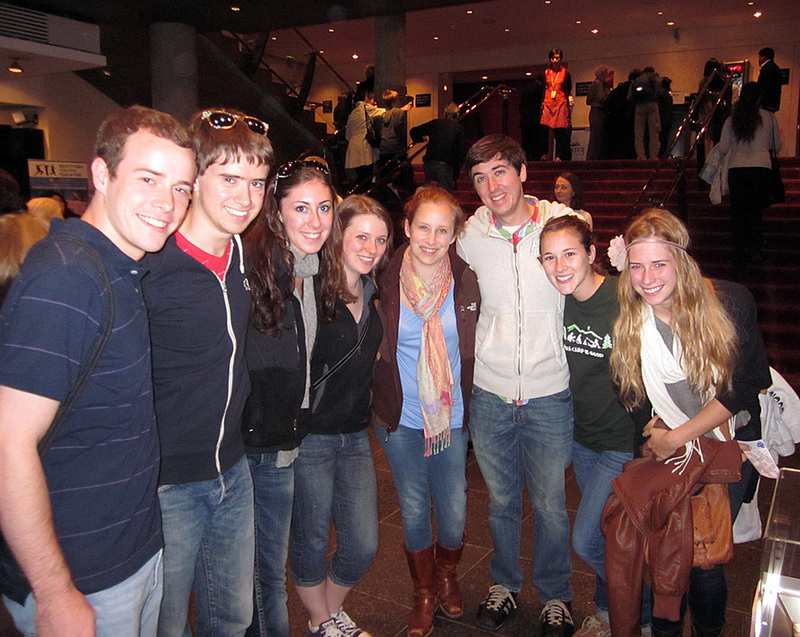 There were ten at first, then twelve (at which point we joked about it being the last supper!) and then at about 5”45 two more joined us. 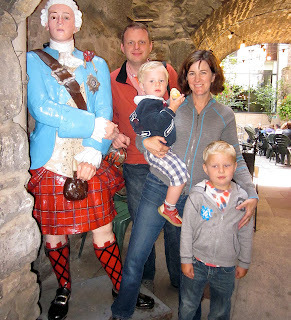 I was flattered by the attention and touched at this gathering on my last trip to Edinburgh, and we all had a very nice chat about traveling while in London, and on other subjects as well – more o’ that! I bid farewell to some of my best friends in Ithacs, the TenEycks, after a dinner at Giuliano’s that took too long to get to the table. Once delivered it was quite fine, but I could tell the family TenEyck was more than ready for this trip to be “history.” I hope they are having a safe journey back across the great pond. 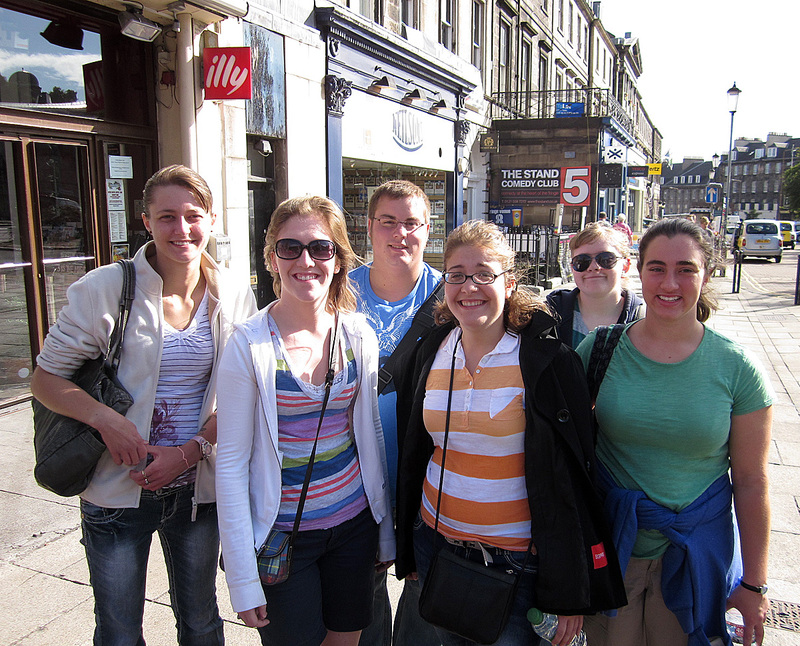 I am very impressed with this group, as all twenty-seven got downstairs on time!The bagged breakfasts were ready for us, and we were rewarded by our early arrival by the train being already in and ready to go at track 11, one of the easiest to get to at Waverley Station. We are now nearing York, after we’ll have a direct run to London, arriving at 11:55. It’s now about 9:40 am. So if all goes well getting onto and off of the tube, we should be back at ICLC by 12”30-12:45. Here’s hoping! 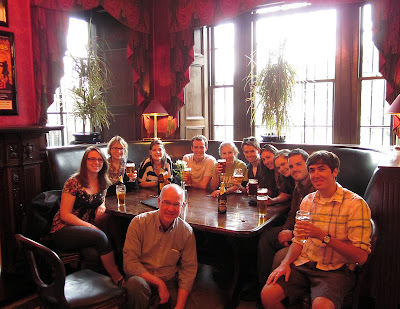 Oh, and if we’re not you probably won’t know about it, as I am declaring this the end of Dottore Giann’s Bloggo Edinburgho, and of the end of his trips guiding students to the Edinburgh Festival Fringe. May the trips continue long after this one, in the younger, very capable hands of Steve TenEyck! If you are yearning for more I may write something before then, but the next scheduled trip is to Bath, Glastonbury and Stonenge on the weekend of 9 September. Stay tuned!